The Inter Regional Mountain Bike Championships, run by British Cycling, brings together the best of young talent from all regions of the UK. The event is made up of teams of Under 14 and Under 16 boys and girls, competing against one another to gain points for their teams. The standard of competition is extremely high, with British and European champions in attendance. 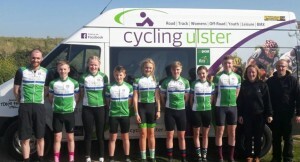 On Friday 22nd September, the Ulster team headed to Essex with Team Coach, Graham Boyd and Team Manager, Lisa Millar. Team Assistant, Gareth Skelly, had already set sail, aboard the Belfast to Liverpool ferry and met everyone else there. The venue for this year’s games was Hadleigh Farm, the same venue used for the 2012 Olympics. The Ulster team was made up of four boys – Drew Armstrong (Killinchy CC), Lee Harvey (Kinning Cycles), Ben Wilson (Dromara CC) and Ryan Skelly (Carn Wheelers). We didn’t have a full complement of girls, unfortunately. 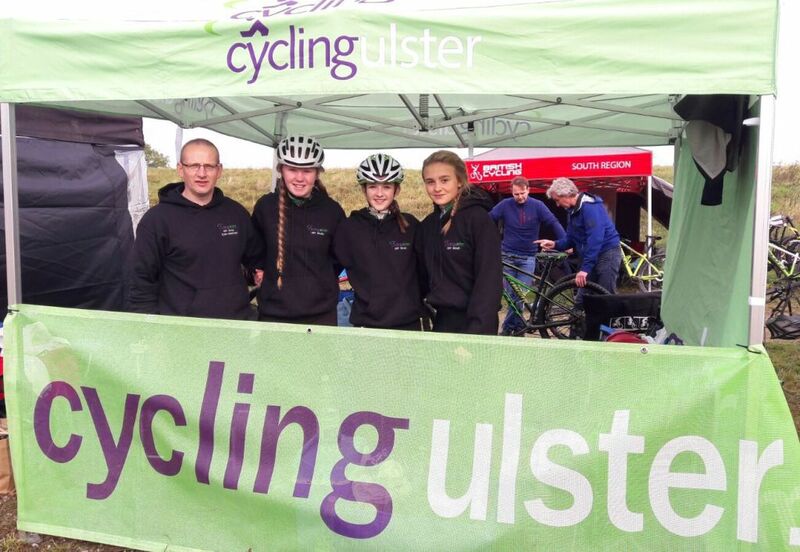 The girls were Darcey Harkness and Katie Neill from Carn Wheelers and Erin Creighton of XMTB. Before the event the riders all attended training and selection days, where we would give them a taste of what to expect. 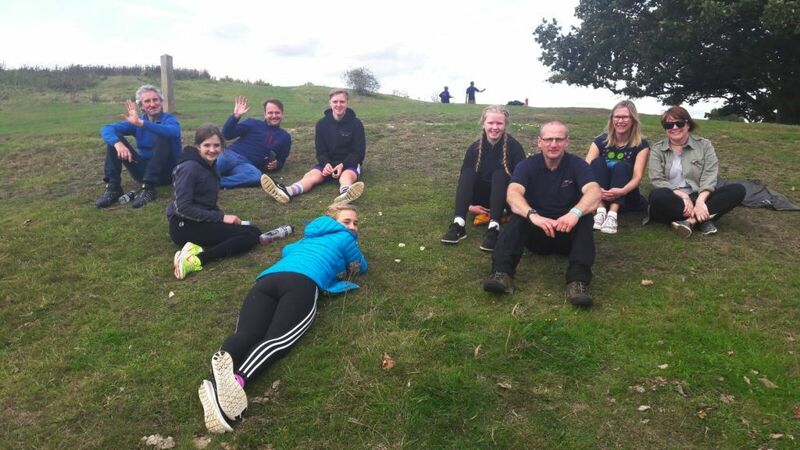 As we had further to travel than the other teams, there wasn’t any opportunity to check out the course on Friday – that would have to wait until Saturday, the first day of competition. After a 6am start and long queues for breakfast we hit the road. At the end, the riders had to remove their rear wheel, hold it above their head, before completing the course in reverse. The girls all completed the course first in their heats, albeit with a few penalties each. Darcey completed a fantastic wheelie but the judge was particularly harsh and penalised her when her front wheel landed slightly outside the stop box. All three excelled with their wheel changes – something they had practised LOTS! In fact, all our boys and girls gained a lot of time over their competitors in this area. The boys, again, were all first back in their heats. Drew and Lee with only one penalty each and Ben and Ryan with none. At the end of the skills’ competition, the team was sitting in 5th place – out of 14 regions. Next up, the riders made their way up to Gareth, who changed their pedals, before making their way to the hill climb. The climb was technical and every single competitor rode it blind. Fastest of the Ulster team was Drew, with a time that gave the European Champion a good run for his money! All riders performed admirably and were in a great position for the afternoon’s event – a “dirt crit”. The dirt crit was some of the most exciting racing I’ve ever seen! Each rider was placed in a group of other riders – A, B, C or D, with every rider getting to ride in an A, B, C or D final, depending on where they finished in their heat. The races consisted of three FAST laps of a short course. Great rides from everyone, with some rotten luck for Ben, who dropped his chain not once, but twice. All credit to him, he remained cool, completed his race before Gareth repaired the bike in time for Ben’s final. Erin also suffered bad luck after another rider crashed into her on the start line. She remained calm and picked her way up through the other riders to finish in an amazing 4th place. After dinner, team meetings and very little down time, seven exhausted teenagers took to bed, in preparation for Sunday. The next task for the team management was to make a selection for the team relay race, which was the first event on Sunday. Outstanding performances from Drew and Lee secured their spots on the team. Selection of two riders from the girls was a difficult task as all had performed so well. In the end, Darcey’s overall consistency and Erin’s stellar ride in the dirt crit earned them the two final places on the team. The relay required each rider to complete a short lap of the XC course. In practise, however, Erin took a nasty fall which required medical attention. Unable to ride, Katie stepped up to complete the team. With Graham’s input, the order of the riders was decided. Drew first, due to his ability to get a good start, Darcey and Katie next, with Lee for a good, strong finish. The rules state that the rider completing the course must place a hand on the barrier before the next rider goes out. A blunder by the first rider in another team meant that Darcey had a false start. He stopped at our barrier instead of his own and touched her hand. Thinking this was Drew, who was actually the rider behind him, she went out for her lap. All part of the learning experience. After the relay race, lunch and prep for the final event – the XC race. The riders were all excited to be riding the full Olympic course – the very course ridden by some of their heroes. To be completely honest, this was the first race where I wasn’t standing down at the line cheering and screaming everyone on as everything had to be tidied away so that Gareth would make it back to the ferry in time. Needless to say, however, everyone performed brilliantly. The team’s final position was 8th – the highest placing for an Ulster Team in the competition. If only we’d had that fourth girl…! Hopefully next year we will be able to improve on an already fantastic result. Many thanks to everyone involved – from Martin and Dylan before the event, to Graham, Gareth and the parents during and to Ric Jamieson and British Cycling for their hospitality. Most of all, thank you to Ben, Darcey, Drew, Erin, Katie, Lee and Ryan for all your hard work, dedication and commitment.